Our New Baum “Toys” Have Arrived! Hello Cyber Space! Blogger A.J. Brahm here, wishing you all a healthy, and happy, new year! Here at Best Graphics we’re happy to see the installation of a few new “toys” on our demo floor, compliments of Baum Folder! Mark Brown, Best Graphics Sales Rep and Baum Folder guru, has been working closely with Jim Brandewie of Baum to provide Best Graphics a few items on consignment. Jim, Regional Sales Manager, and Ken Poling, Baum’s lead Manufacturing Rep, arrived on Tuesday afternoon to install the items. 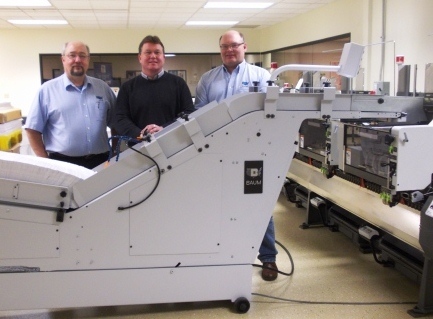 They placed a BaumPrint-18 2-Color Press, Baum Hopper/Loader, Baum 714XA Autofold Air-Feed Tabletop Folder, BaumCut 31.5″E Hydraulic Paper Cutter on our nearly 10,000 Square Foot Show Room Floors. Say hello to Ken, Mark and Jim everybody! 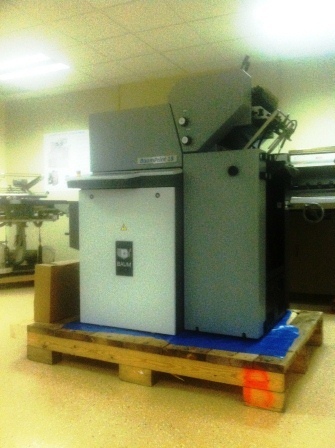 They’ve installed this new, Baum Hopper/Loader on our Osako Tener Alpha Saddle Stitcher. As the exclusive North American importers of Osako Saddle Stitchers, we think the Baum Hopper/Loader is an excellent complimentary piece of equipment we can sell, and service, to prospective customers coming through our facility. 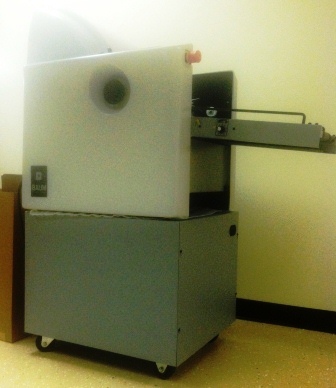 The same goes for the BaumCut 31.5″E Hydraulic Paper Cutter, which couples nicely with our Itoh eRC Double Arm Pull Paper Cutters, yet another product line that we proudly import and distribute exclusively throughout North America! 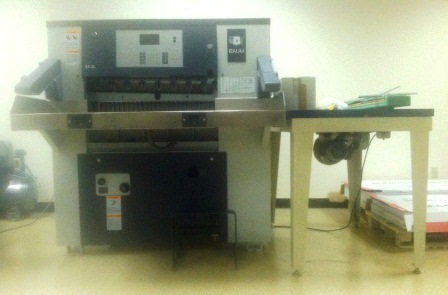 Don’t want to put a bottleneck on your Paper Cutter with those small format, digital print jobs? The BaumCut is the perfect remedy. Its fully programmable, stores jobs, and can pull up repeat jobs via barcode scanners. A.J. Brahm, Sales Representative & self-appointed Chief Social Media Officer!